We previously reported on General Carter F. Ham’s testimony before the Senate Armed Services Committee, summarizing his comments on the challenges of environmental and climate security in Africa (particularly in regards to water), and what U.S. Africa Command needed to meet those challenges. The full testimony is now up. We have posted the exchange between Senator Mark Udall and General Ham, which touched on these areas, below. SEN. MARK UDALL (D-CO): Thank you, Mr. Chairman. Thank you for taking the time to be here with us today. General Ham, if I might, I’d like to turn to you. And you may remember that during your confirmation hearing last year, I noted that your predecessor had co-sponsored a study by the DSB, the Defense Science Board, on the transit implications of climate change for national and international security. And I think the study has special emphasis on Africa. The report was published last October and is, in my view, a detailed, thoughtful analysis of, quote, “observable, measurable and real,” unquote, impacts of climate change. The report also contains assessments of the consequences of climate change that, quote, “will continue to have major consequences for the political, economic and geographic world,” unquote. So the basic conclusion of the DSB was that changes in climate patterns present new challenges to regional security and stability. The report goes on to warn that failure to anticipate and mitigate the impacts increases the likelihood of more failed states and the potential for conflict. I was also really interested in the specific recommendations of the report regarding the role of the DOD and combatant commands as a part of a whole-of-government effort to help avoid such humanitarian and security crises. And in my view, those conflicts could pose a serious threat to U.S. national security interests in Africa and elsewhere. Could you comment on your personal views on the overall findings and recommendations of the DSB, and would you agree that resource scarcity and the impacts of climate change have the potential to cause or aggravate conflicts in your AOR? GEN. HAM: Senator, there’s no question but that environmental security can have a dramatic effect on overall security, both in individual states and more regionally. I would tell you my frank assessment is that we’re having better success in response to environmental security challenges than we are finding traction for preventative or predictive actions that could be taken. SEN. UDALL: That makes complete sense. 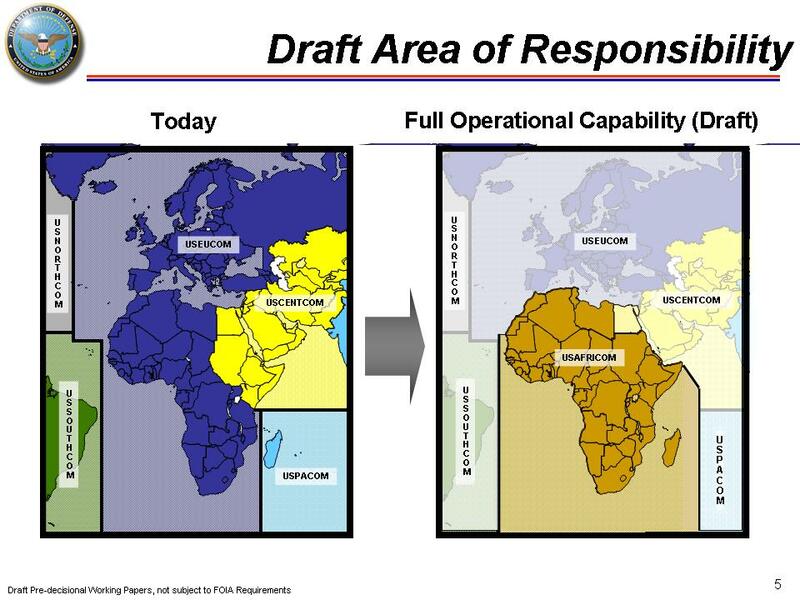 There were specific recommendations in the report regarding the role of combatant commands, including AFRICOM. I know you’ve just spoken to those in a general way. Are there any additional comments you’d want to make on specific recommendations that are in the DSB? GEN. HAM: Senator, one is the presence of some subject-matter experts, and specifically water experts on the staff, again, leading to the interagency nature of the command. So we have had in the past representatives from the U.S. Army Corps of Engineers and from the U.S. Geological Survey present on the staff to help us with those issues. We’re currently gapped right now; we don’t have folks present. But both those organizations are sending people to us we hope will join us this summer. SEN. UDALL: I think you anticipated my next question, which was, it strikes me that we need to develop the data and systems to help identify the actions necessary to avoid or at least mitigate the effects of climate. Is that what you were just speaking to? GEN. HAM: I would agree with that, sir. And again, it’s not just defense; it’s working with the USAID, with others, and in many cases, USAID partnered with nongovernmental organizations to assist African countries in planning and preparing for the impacts of environmental change. SEN. UDALL: Finally, on this subject — and thank you for your attention and interest in this — could you provide your views concerning whether actions to address the humanitarian and security effects of climate change should be an integral part of the whole-of- government conflict-avoidance strategy? Perhaps it could be addressed within the newly established Global Contingency Fund framework or other multiagency efforts focused on avoiding conflict? GEN. HAM: Sir, it necessarily must be a whole-of-government approach. No one element of the government has all the resources, authorities or capabilities to address the impacts on security of environmental change. To that end, I think we have a responsibility at U.S. Africa Command to work very closely not only with the chiefs of mission in Africa, who have the responsibility to pull together that whole-of-government effort, but also with the various bureaus in the State Department, with USAID Central and with others to make sure that we are, first of all, aware of one another’s capabilities in finding increased opportunities to synchronize our efforts, again, with an end toward assisting the African countries, deal with an increasingly serious security matter that ultimately contributes to our security by them being more secure. SEN. UDALL: So we’d deploy all of our influence, our power, our smart power, our kinetic power in combination. Thank you for that insight. By Francesco Femia & Caitlin Werrell in Africa, climate-security, United States, water on March 15, 2012 .